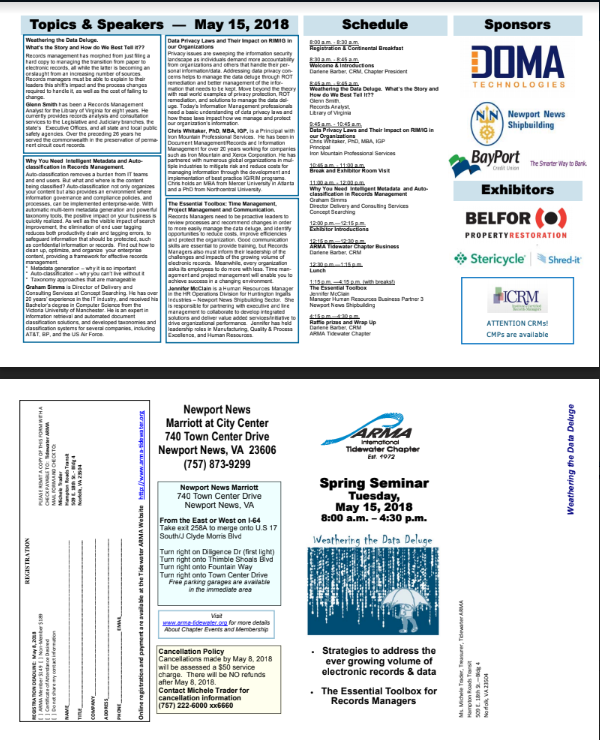 2018 Annual Spring Seminar - Tidewater ARMA - Tidewater Chapter of ARMA Inc.
Download the brochure to print and mail in your registration with a check or Pay online with Paypal and complete the Online Registration Form below. For users that are paying online, please fill out the Registration form below. This form is to be filled out for those individuals that will be paying online only. Weathering the Data Deluge. What's the Story and How do We Best Tell it? Records management has morphed from just filing a hard copy to managing the transition from paper to electronic records, all while the latter is becoming an onslaught from an increasing number of sources. Records managers must be able to explain to their leaders this shift’s impact and the process changes required to handle it, as well as the cost of failing to change. Data Privacy Laws and Their Impact on RIM/IG in our Organizations. Principal, Iron Mountain Professional ServicesPrivacy issues are sweeping the information security landscape as individuals demand more accountability from organizations and others that handle their personal information/data. Addressing data privacy concerns helps to manage the data deluge through ROT remediation and better management of the information that needs to be kept. Move beyond the theory with real world examples of privacy protection, ROT remediation, and solutions to manage the data deluge. Today’s Information Management professionals need a basic understanding of data privacy laws and how these laws impact how we manage and protect our organization’s information. The Essential Toolbox: Time Management, Project Management and Communication. Records Managers need to be proactive leaders to review processes and recommend changes in order to more easily manage the data deluge, and identify opportunities to reduce costs, improve efficiencies and protect the organization. Good communication skills are essential to provide training, but Records Managers also must inform their leadership of the challenges and impacts of the growing volume of electronic records. Meanwhile, every organization asks its employees to do more with less. Time management and project management will enable you to achieve success in a changing environment. Why You Need Intelligent Metadata and Auto Classification in Records Management. Director of Delivery & Consulting Services, Concept Searching, Inc.
Auto-classification removes a burden from IT teams and end users. But what and where is the content being classified? Auto-classification not only organizes your content but also provides an environment where information governance and compliance policies, and processes, can be implemented enterprise-wide. With automatic multi-term metadata generation and powerful taxonomy tools, the positive impact on your business is quickly realized. As well as the visible impact of search improvement, the elimination of end user tagging reduces both productivity drain and tagging errors, to safeguard information that should be protected, such as confidential information or records. Find out how to clean up, optimize, and organize your enterprise content, providing a framework for effective records management. Access all seminar handouts at the Meeting Review page.